Where are the Abu Gharib Pics? I decided to do some more research. If you google “Soldiers torturing Iraqi Children” you’ll find articles such as, “U.S. Troops Caught torturing Iraqi Kids” However, the content is not quite what you were expecting to see. Pictures of loving american soldiers playing with Iraqi kids, giving out food, and even one sad picture of a soldier weeping over a bloodied Iraqi’s kid corpse in his arms. While these pictures are very touching and uplifting they are not an accurate representation for the terrorized Iraq the U.S. has built. I did some more searching, and I came across this youtube video that shows a more realistic situation. I encourage you watch the entire bloody 2 minutes. It’s not clear whether these are British or American soldiers, but regardless, it’s some terrible stuff. However, this isn’t Abu Gharib though–This was filmed in Iraq, outside of the prison to civilian children. So what exactly is happening in Abu Gharib? The following is from WhatReallyHappened.com about some torture methods used in Abu Gharib. h. Using military working dogs to frighten and intimidate detainees with threats of attack, and in one instance actually biting a detainee. m. Taking photographs of dead Iraqi detainees. These findings are amply supported by written confessions provided by several of the suspects, written statements provided by detainees, and witness statements. On at least one occasion, the 320th MP Battalion at Abu Ghraib held a handful of “ghost detainees” (6-8) for OGAs that they moved around within the facility to hide them from a visiting International Committee of the Red Cross (ICRC) survey team. This maneuver was deceptive, contrary to Army Doctrine, and in violation of international law. It’s not necessarily anything new for people following the mainstream news on Abu Gharib. These are only a few of the torture methods as of 2004. You won’t find “Torture kids to get them to talk” listed on there, but that does not mean i does not exist, although it is proving very difficult to find any evidence on that torture method. Perhaps using the children of the Iraqi detainees is not a common practise, and I do not doubt that it has been done. By looking for this practise I came across something more shocking: The detaining of innocent Iraqi children in Abu Gharib. Iraqi TV reporter, Suhaib Badr-Addin al-Baz, arrested while making a documentary and thrown into Abu Ghraib for 74 days, told Mackay he saw “hundreds” of children there. Al-Baz said he heard one 12-year-old girl crying, “They have undressed me. They have poured water over me.” He said he heard her whimpering daily. Al-Baz also told of a 15-year-old boy “who was soaked repeatedly with hoses until he collapsed.” Amnesty International said ex-detainees reported boys as young as 10 are held at Abu Ghraib. German TV reporter Thomas Reutter of “Report Mainz” quoted U.S. Army Sgt. Samuel Provance that interrogation specialists “poured water” over one 16-year-old Iraqi boy, drove him throughout a cold night, “smeared him with mud” and then showed him to his father, who was also in custody. Apparently, one tactic employed by the Bush regime is to elicit confessions from adults by dragging their abused children in front of them. That’s only a segment of the full article. So what does this have to do with witholding the pictures of Abu Gharib from the American public? The previous evidence of what’s happening in Iraq is demonstrating what happens outside of Abu Gharib. What’s happening inside Abu Gharib where the U.S. has complete control–Is multiplied, especially if we can expect the witheld pictures to be worst than the ones available on Google. One of the first pictures we recieved from Abu Gharib. They attach a wire of some sort to the following body parts as seen in the picture, (the one going inside the cloak is attached to the expected) and this stimulated some sort of electrical current, so the prisoner believes he’s being electricuted to death. 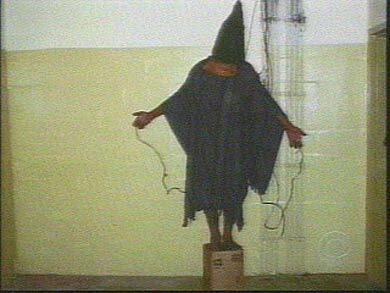 The Abu Gharib pics have been witheld from the public because “The most direct consequence of releasing them I believe would be to inflame anti-American public opinion and to put our troops in greater danger.” Obama. The last time Abu Gharib torture pictures were released it did in fact, elicit an angry response from the Arabs, and public in general. First came shock, than the anger. Obama wants to prevent the public for having another reason to grow Anti-American, or anti-nationalistic. The sad truth is it’s true–By not releasing the pictures he is containing the public’s perspective on Iraq, and likewise in Iraq. If the American public saw these new pictures they would in fact look at the occupation in Iraq negatively, and would show a different face toward torture. These pictures, these videos–The thing is, torture hasn’t proved effective. We found Saddam Hussein in a hole, after torturing countless number of Iraqis. Will the same be for Bin Laden?